How was everyone’s first day back to school? Well if you have school aged children. Ours always head back the day after Labor Day. I’m aware though that a lot of districts start earlier in the Summer. This year we have a senior! Gah, how did that happen? It goes by so, so freakin’ fast. We’ve also got a Sophomore, and a freshly minted 3rd grader. My second year of not having one in every level, and I’m still not quite sure how I feel about it. I feel like I’ve got a two feet, each in a different world. On the one hand, we’re planning out college applications, ordering senior pictures, and waiting on SAT scores. On the other hand, we’re getting ready with multiplication and division flashcards, discussing our Summer reading book- Freckle Juice (not that my youngest need ever worry about concocting a magic potion to help him freckle), and gearing up for the shift this year from learning to read, to reading to learn. Totally different stages in life and their educations, both equally important and critical. As you can imagine, it’s both fun and nerve racking. Mostly though, it’s only nerve racking for Mom. The norm, lol. One area where I don’t stress? Lunch. I know plenty of people who brown bag organic, peanut free, gluten free, etc uber healthy lunch options every day of the week for their kids. I applaud you. Seriously. Go ahead, girlfriend! But I’m gonna keep it real, and that ain’t me. I’m a-ok with my boys buying their lunch at school (even breakfast) when they so choose. It’s actually fun checking the new menu each month with the youngest. That being said, some of the choices I wouldn’t even eat. So on those days, we pack. Again though– in my own best interest, we keep it simple. Some lunch is better than no lunch. When they are packing lunches, I do take requests– just not the night before. One of their favorite things to find in their lunch boxes? 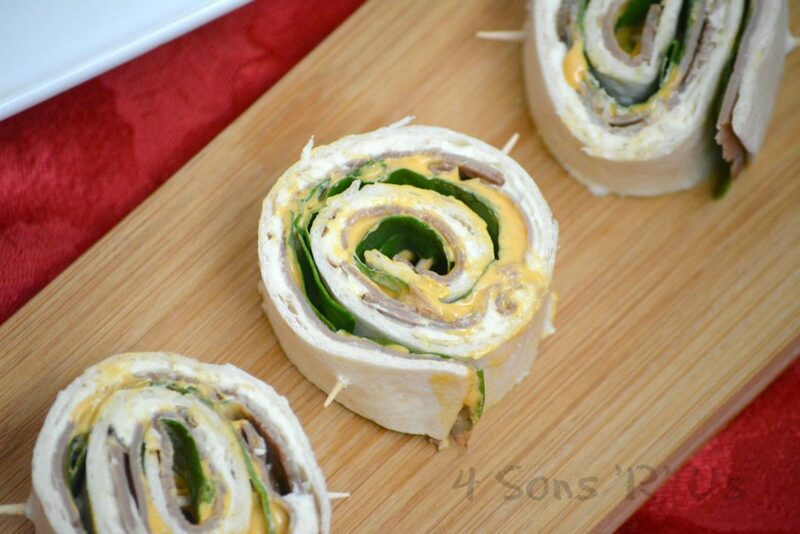 These Copy Cat Costco Turkey Swiss Pinwheels. They’re quick & easy. Super flavorful. And it gets the kids to eat a few veggies they’d otherwise turn their noses up at and pick off a traditional sandwich. 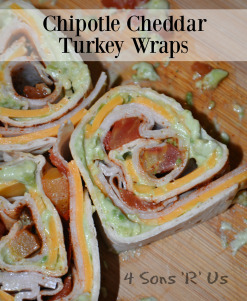 I can make a batch on Sunday evening, and have them bagged and ready to grab, even on the go. Perfect for those mornings when I hit the snooze button 1, 2, ok 3 times. 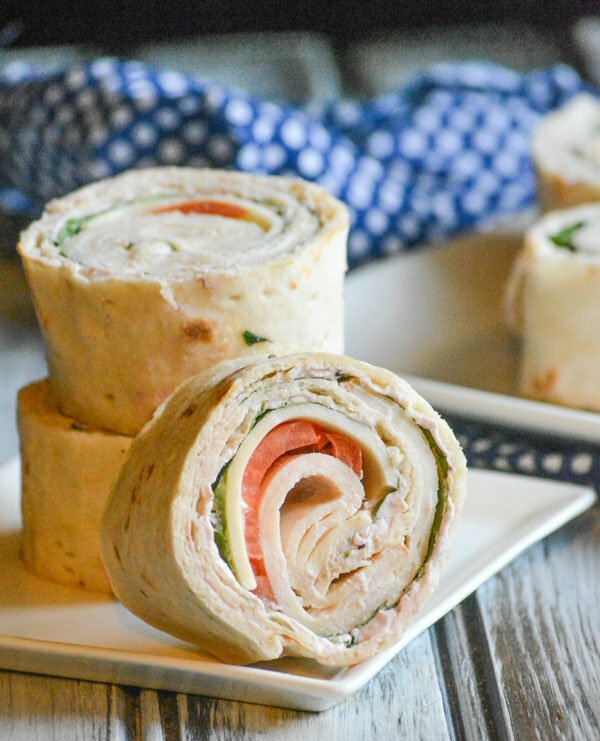 Copy Cat Costco Turkey Swiss Pinwheels are just as hearty and filling as a full sandwich, but in fun finger food form. Perfect for little hands, or regular ones when your brown bag needs to see a change. Flour tortillas are covered with a homemade creamy cranberry spread. 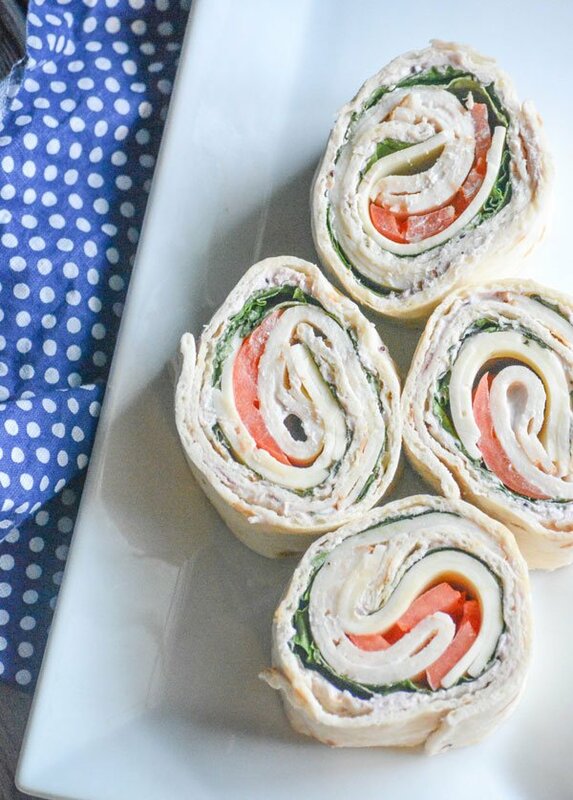 Topped with layers of lettuce, turkey, tomatoes, and finally Swiss cheese before being wrapped up and sliced into pretty, edible pinwheels. 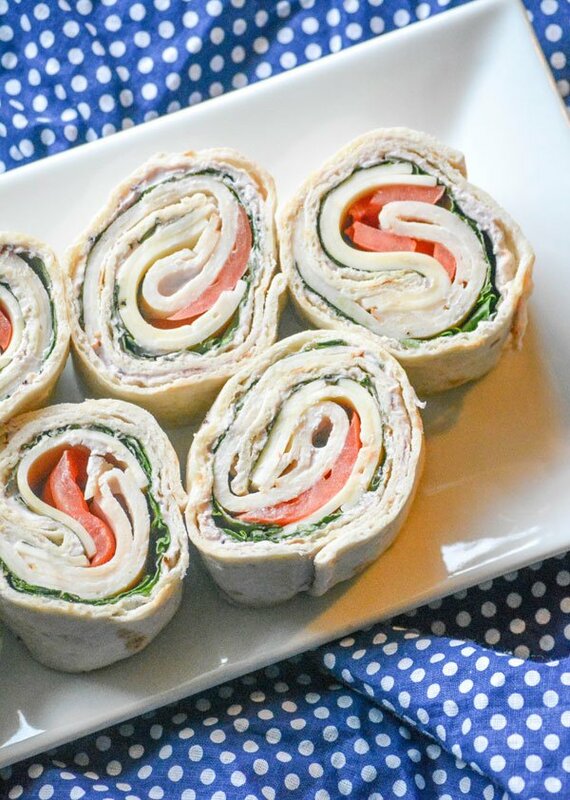 A perfect Costco copy cat, these pretty pinwheels are great for lunch, an easy appetizer at parties, or even finger food for Game Day. Whip together the cream cheese and cranberry sauce in a small bowl. Working with one tortilla at a time, spread a thin layer of the cream cheese mixture evenly out over the bottom side of the tortilla. Spread three lettuce leaves out down the center of the tortilla. 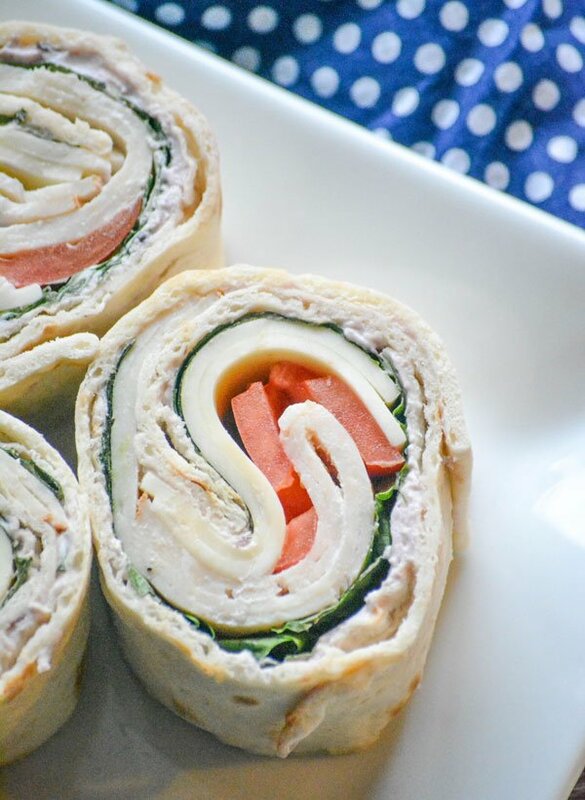 Top the lettuce with two slices of turkey, followed by 4 slices of Swiss-- again straight down the middle. Top with a few slices of tomato in the center. 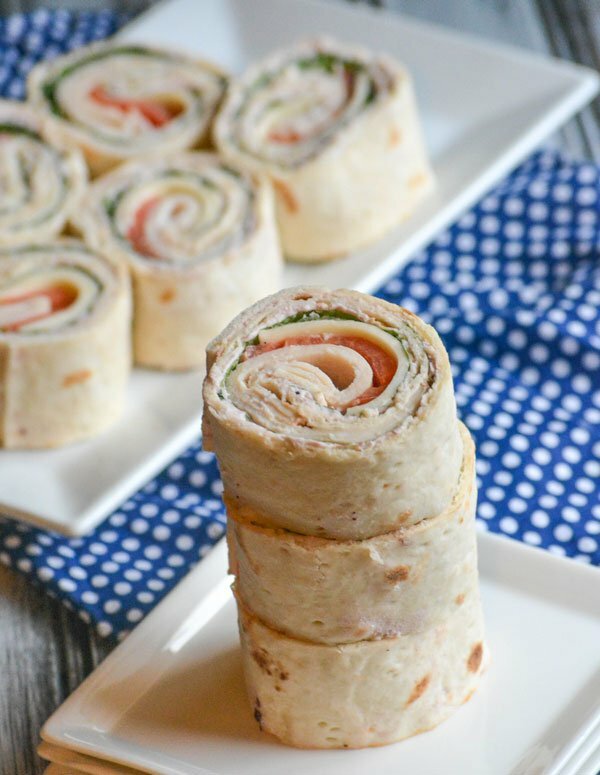 Pick a side, and roll the tortilla up tightly towards the filling, like a jelly roll until it's completely wrapped and the filling's secure inside. Repeat as needed until all the tortillas are filled and rolled. Wrap them each securely in plastic wrap. Refrigerate for one hour. As needed, remove the tortillas from the fridge and plastic wrap. 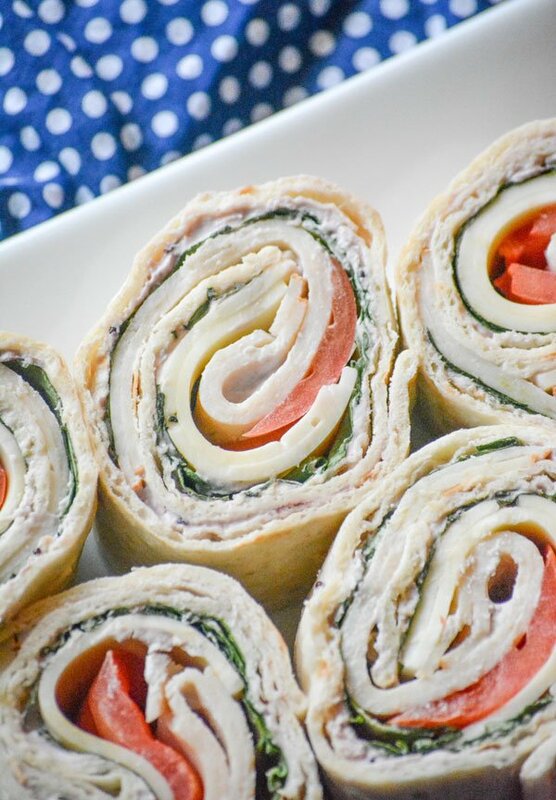 Use a sharp knife to slice into 6-8 pinwheels. Discard any unfilled ends. Loved the turkey pinwheels😍!! This is going to be a hit at the party.. thanks for sharing this with all of us..
Yep, they’re a real crowd pleaser for sure!